The Los Angeles Marathon is an annual world-class running event held each spring in Los Angeles, California. The 26.219 mile (42.195 km) footrace, inspired by the success of the 1984 Summer Olympic Games, has been contested every year since 1986. The 34th edition of the LA Marathon will be the ninth time the course will start at Dodger Stadium and end in Santa Monica, incorporating many iconic landmarks for which Los Angeles is world renowned. My home or business is right along the LA Marathon course, how do I get in and out of my driveway if it leads directly into the course? 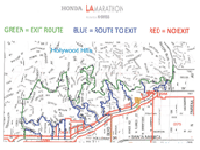 While the LA Marathon is in progress, no vehicle will be allowed on the course route. So if the driveway to your home or business leads directly to the course route, no vehicle will be allowed to leave or enter your driveway until the Officials reopen the streets in your area. If you must use your car on race day, please park your vehicle, the night before, around the block or on a nearby street that doesn’t have any parking restrictions on race day. The entrance to my home/business is not on the LA Marathon course route, however is located on a street that appears to be closed. How can I reach my home/business? Please check our map to see if there is an alternate path to your home or business via a smaller street. If there are none, or your home or business is on the block adjacent to the course route, slowly approach the Officers or Transportation Engineers at the location and kindly ask them for access to the street and explain to them that you live or work locally within the closure area, but not on the course route itself. I normally park my vehicle on a street that the course route is going through. Can I leave my vehicle parked there during the event? No, you may not. If you normally park your vehicle overnight on a street that the Marathon course will be going through, please park your vehicle, the night before, around the block or on a nearby street that doesn’t have any parking restrictions on race day. Otherwise, your vehicle will be cited and towed away to the local impound yard. Why are major streets closed blocks away from the LA Marathon route? Since major streets or arterials tend to carry more traffic, often times, these streets are closed at the major intersections blocks before the course or event route in order to more efficiently detour the heavy traffic to other major streets that can handle it. Otherwise, the smaller residential streets directly adjacent to the course routes will become clogged and saturated with vehicles that don’t quite have an outlet. How do I get to my destination that’s on the other side of the route? If you must drive to your destination on the other side of the course route, you can use the orange detour routes shown on the Commuterama map to navigate yourself over, under, or around the course route at several points. If your destination is just on the other side of the course route, it may be best to simply park your vehicle on a street that’s on your side of the course route, and walk across it to your destination. This may save you a lot of time from having to navigate detour routes that a lot of other motorists are probably also using. Please use caution, however, if you do decide to walk across the route during the marathon. It is a race after all! Why have the streets near the LA Marathon Course Route become Temporary No Parking zones even though the Course Route is blocks away? Major streets that are parallel or near to the course route are often used as detour routes. To increase the efficiency or capacity of these detour routes during the event, parking restrictions are often put in place on these streets. Please pay attention to any temporary parking restriction signs posted. Parking enforcement will be strictly enforced in all cities on race day. My vehicle was impounded because it was in a Temporary No Parking zone, where do I go to retrieve my vehicle? Depending on what city your car was towed in, you will have to contact the appropriate law or parking enforcement agency. This year’s LA Marathon goes through several different cities. Will my bus service be interrupted? If the route of the bus that you normally take runs on or intersects any portion of the course route, then your bus service will be interrupted. I’m dropping off a participant of the LA Marathon. Where is the best drop off point and where is the best location to pick them up after the race? It would be best to drop off race participants at the Start Line in Dodger Stadium. This year, vehicle access to the stadium will be allowed for both participant drop-offs and for participants who wish to park their car at the stadium. Please note that only the Golden State Gate (1850 Academy Rd, Los Angeles, CA 90012), accessible from Stadium Wy, will be open to vehicular traffic on race day. None of the other gates will be open due to shuttle access and road closures. Plan on arriving early! 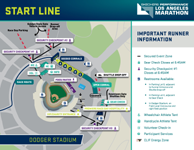 The LA Marathon strongly advises all participants to arrive at the Stadium a minimum of 60 to 90 minutes before the race. Families and friends of participants can meet at the Family Reunion area near the finish line in Santa Monica. The Family Reunion area is located on Ocean Av between Santa Monica Bl and Broadway Av. If you don't want to meet your family member or friend at the family reunion area and would rather stay in your vehicle, the City of Santa Monica has designated the east side of 5th Street between Broadway and Wilshire as the post-race pick up zone. To access this area, take I-10 West and exit 5th Street. Continue past Colorado Ave and Broadway. Three blocks of loading zone will be provided on the right hand side of the street. &nbps;To return to the freeway, turn right at Santa Monica Blvd, Arizona Ave, or Wilshire Blvd and then right at Lincoln Blvd. For more details, please visit lamarathon.com and smgov.net. Why are major streets closed blocks away from the LA Marathon course route? I need to pick up my family member or friend at the end of the Marathon. Where should I go? What's the parking situation going to be like in Santa Monica on Race Day? Midnight – 6:00 a.m. – Reserved parking for race participants only in the Civic Center Lots. All other city-owned lots and structures are closed. Parking at on-street meters will be subject to normal regulations. 6:00 a.m. – 12 p.m. – All lots and structures will be open, vehicles entering will pay posted rates. No free Main Street Farmer’s Market parking in the beach lots on March 24. Additionally, please keep in mind that Santa Monica has extensive residential preferential parking regulations which prohibit or limit parking in residential neighborhoods. The City of Santa Monica strongly encourages you to pre-purchase your L.A. Marathon parking to ensure you have a place to park and are able to catch the shuttles to Dodger Stadium. 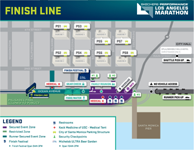 To reserve your parking space online, please visit https://lamarathon.clickandpark.com. Please visit www.smgov.net for more details. I’m participating in one of the races, what are my options for getting to the start line in time? You can either board a shuttle, be dropped off at the start line, or drive yourself to the start line. This year, you may board shuttles at the below locations (restrictions apply). See www.lamarathon.com/race-weekend/transportation for details. Official Downtown LA Marathon Hotels - Participants that book a room in a Downtown LA hotel through the LA Marathon's Hotel Reservation Center will receive a shuttle wristband upon check-in to their hotel. Wristbands must be worn to board Downtown LA shuttles. 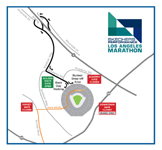 To be dropped off at the start line, you must enter Dodger Stadium through the Golden State Gate via Stadium Wy. All other gates will be closed due to road closures and shuttle access. Vehicles dropping off participants will be directed to Lot 4 (Dodger Stadium Race Day Parking & Drop Off Map). Participants will be allowed to park their vehicles at Dodger Stadium. However, NO SHUTTLES will be available after the race to bring you back to Dodger Stadium. You will need to make your own arrangements to return to Dodger Stadium if you chose to drive yourself to the start line. Cars will NOT be allowed to park overnight at Dodger Stadium between Sunday, March 24th and Monday, March 25th. Please retrieve your vehicle by 8 PM on March 24, 2019. Vehicles left in the lot after 8 PM are subject to tow at their owner's expense. 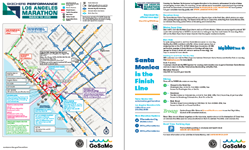 For more information on parking or reserving your space on a shuttle, please visit lamarathon.com. When do the road closures begin to clear up? The course route will begin to be cleaned and reopened to normal traffic in a rolling manner. As soon as the start line clears, crews will start cleaning the route and reopening the streets at a pace no faster than a 15 minute per mile pace. If I’m a slower runner and the Official End-of-Race Vehicle has already passed me, what should I do if the officials start reopening the course route to normal vehicular traffic? If you wish to continue to on, you can do so, but you must leave the roadway. You will have to run/walk on the sidewalk and assume the role of a normal pedestrian obeying all traffic laws and signals. Sufficient finish line personnel will remain on duty until 4 PM to record times for runners and to provide medical assistance and refreshments. If I get dropped off at the start of the LA Marathon, where can my family or friends pick me up? This year, the City of Santa Monica will be providing a designated runner pick-up area to allow family members and App-based ride hailing services (e.g. Uber & Lyft) to conveniently pick up runners after the Marathon without the need to park. The runner pick-up zone will be along the East side of 5th Street between Broadway and Wilshire Blvd. To access this area, take I-10 West and exit 5th Street. Continue past Colorado Ave and Broadway. Three blocks of loading zone will be provided on the right hand side of the street. To return to the freeway, turn right at Santa Monica Blvd, Arizona Ave, or Wilshire Blvd and then right at Lincoln Blvd. Is parking for participants allowed at Dodger Stadium on race day? Yes, participants will be allowed to park their vehicles at Dodger Stadium. However, NO SHUTTLES will be available after the race to bring you back to Dodger Stadium. You will need to make your own arrangements to return to Dodger Stadium if you chose to drive yourself to the start line. Cars will NOT be allowed to park overnight at Dodger Stadium between Sunday, March 24th and Monday, March 25th. Please retrieve your vehicle by 8 PM on March 24, 2019. Vehicles left in the lot after 8 PM are subject to tow at their owner's expense.